The Samsung Galaxy Note 7 SNAFU continues, and it’s not looking good at all for the company. Ahead of Apple’s highly anticipated iPhone 7 launch tomorrow, Samsung has officially recalled the Note 7 in the USA, with the U.S. Consumer Product Safety Commission jumping in. Samsung has received 92 reports of the batteries overheating in the U.S., including 26 reports of burns and 55 reports of property damage, including fires in cars and a garage. The recall in the USA joins Health Canada’s recall, which was announced officially on September 12th. Health Canada says they have received one report “of a phone battery overheating,” and so far no injuries have been reported. You can report any Note 7 health or safety incidents here. 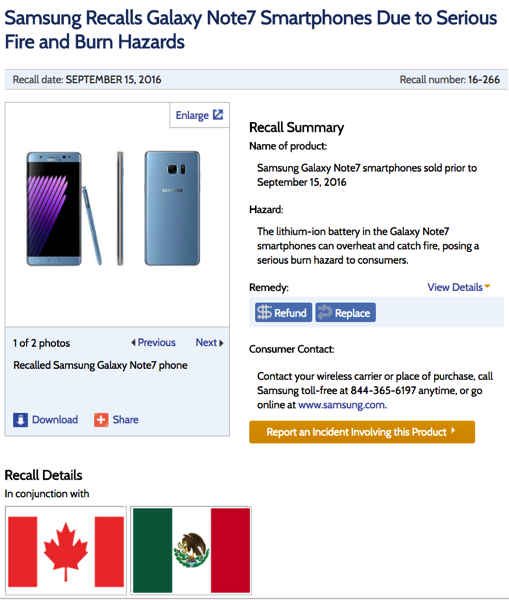 Health Canada explains there were roughly 21,953 recalled Note 7 units sold in Canada, from August 19 to September 1, 2016. 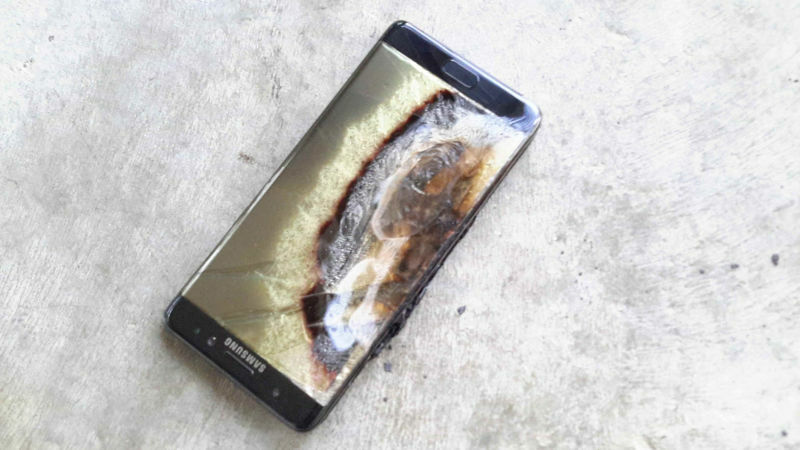 What should you do if you or someone you know has a recalled Note 7 in Canada? Consumers should immediately power down the recalled Samsung Note7 smartphone and register as soon as possible for the Canadian Product Exchange. Consumers can register for a replacement product or contact Samsung Electronics Canada Inc. toll free at 1-800-517-3507 from Monday to Sunday 8:00 am to 8 pm (EST). Samsung’s handling of its Note 7 recall was criticized early on by Consumer Reports, with the latter saying the Korean company should have gone directly to the U.S. Consumer Product Safety Commission from the get-go. Looks like Samsung finally caved to go that route, based on today’s announcement. Last week, the U.S. Federal Aviation Administration issued a statement, warning passengers to not use or charge their Note 7 onboard airplanes. Some airlines have already banned the device from boarding. Samsung’s market value has plummeted a whopping $26 billion since it announced its Note recall. Ouch. Earlier this week, Samsung issued a temporary fix in South Korea for existing users who refuse to return their faulty devices. The solution was to send out an over-the-air update, to limit battery charging to 60%. 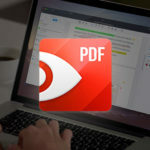 The update will first have to make its way through carriers worldwide, then to consumers. In an initial statement on its U.S. website on Sept. 2, Samsung said there were battery issues with the phone, but didn’t detail the problem, nor did it advise customers to turn off their phones. It also said owners could exchange their phones as early as that week. Compounding the confusion, some customers say they were given contradictory information when they went to exchange their devices. iPhone 7 mania is already underway, with Apple announcing earlier today all Jet Black models have sold out, while retail stores won’t likely have iPhone 7 Plus in stock, at all. The thought of knowing your smartphone could explode or catch on fire, is frightening. Samsung really screwed this up.